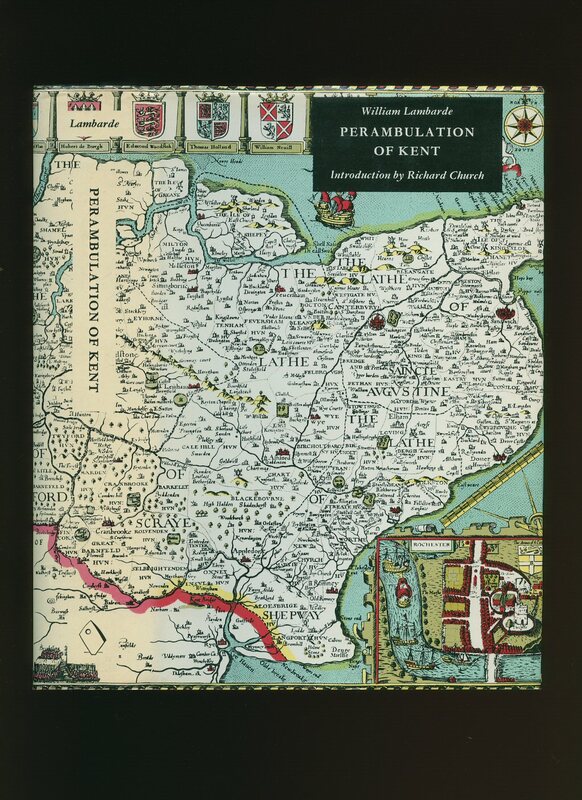 A Treatise [The History] of the Roman Ports and Forts in Kent. Published by James Brome, M.A. Rector of Cheriton, and Chaplain to the Cinque-Ports. To which is prefixt the life of Mr. Somner. 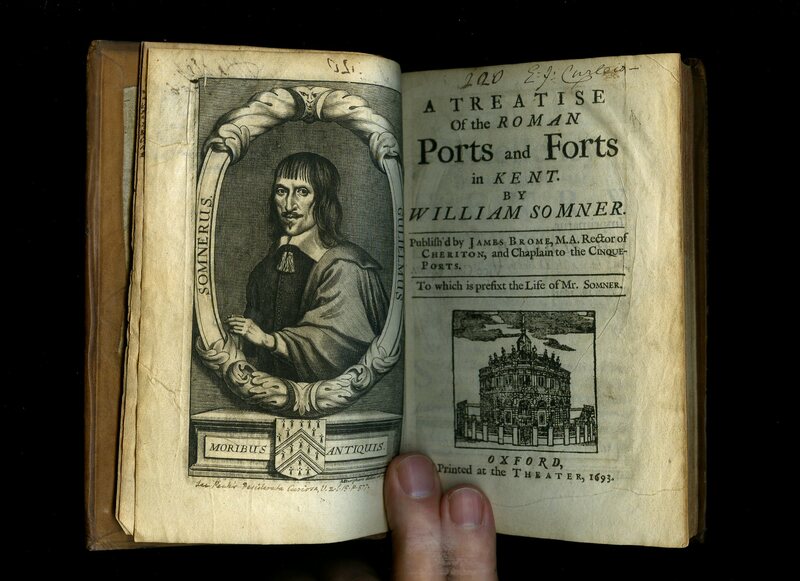 Somner, William [1598-1669] was an English antiquarian scholar and the author of the first dictionary of the Anglo-Saxon language. Printed at the Theater, Oxford First Edition 1693. Oxford 1693. First edition in contemporary calf, raised bands to the spine. 8vo. 7½'' x 5''. Contains [xvi] 118, [ii] 117 [xvi] printed pages of text, engraved portrait frontispiece. Includes a Catalogue of the Lord-Wardens of the Cinque Ports. 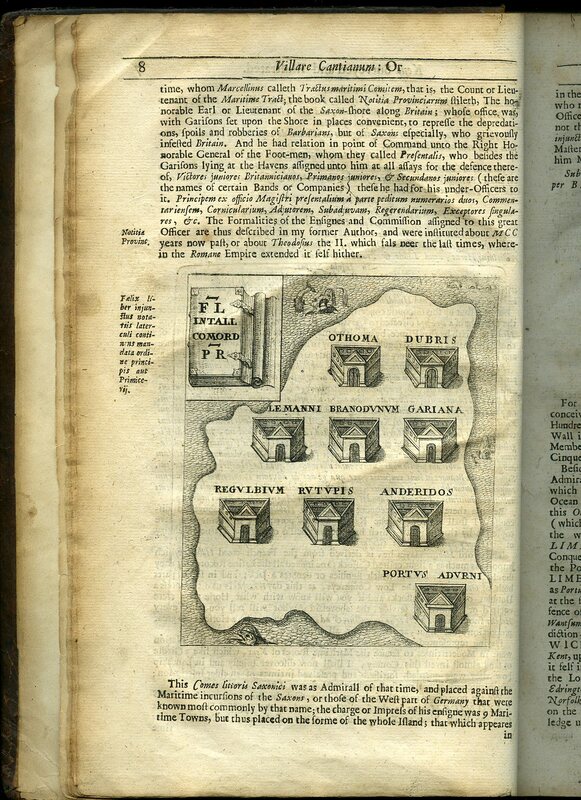 Somner's earliest work was The Antiquities of Canterbury; or a Survey of that ancient Citie, with the Suburbs and Cathedral, London, 1640, dedicated to Archbishop Laud (reissued 1662; 2nd edit, by Nicholas Batteley, London, 1703). 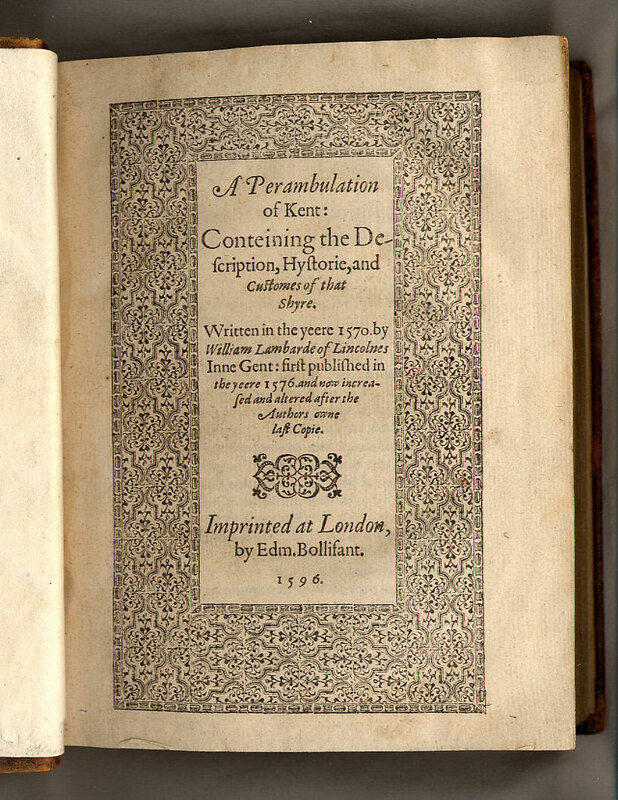 At the suggestion of Meric Casaubon he acquired a knowledge of Anglo-Saxon, and then wrote Observations on the Laws of King Henry I, published by Roger Twysden in 1644, with a new glossary. 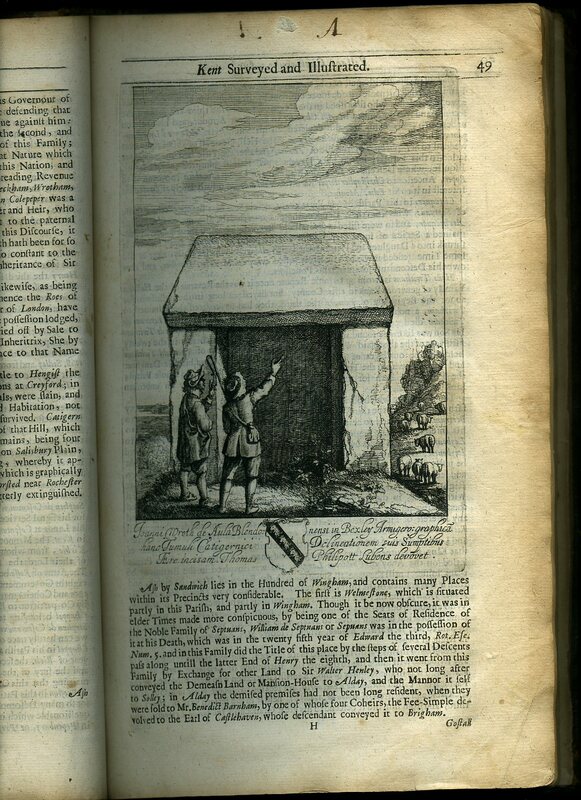 He made collections for a history of Kent, but abandoned this undertaking; this book being a portion of the work published at Oxford in 1693 by the Rev. James Brome, with notes by Edmund Gibson, and a life of the author by White Kennett. Joints cracked, rubbing to the covers, lengthy text to the front free flypaper, paper clean and fresh with only minimal age toning to the paper edges. Member of the P.B.F.A. 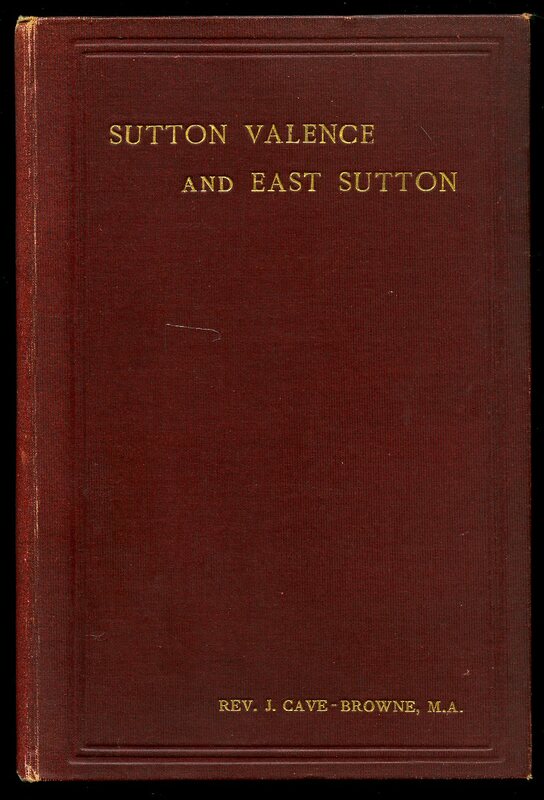 Published by J. Salmon 85-87 High Street, Sevenoaks First edition 1909. 1909. First edition hard back publisher's original sage green cloth covers, gilt lettering and lavish decorations to the spine and the upper panel, additional gilt leaf design of The Pantiles, Tunbridge Wells to the upper panel, top edge gilt, bevelled edges. Quarto 9½'' x 7''. Contains 296 printed pages of text with 63 captioned tissue guarded colour cold plates, 17 monochrome illustrations on glossy paper. Former neat ink message to the upper paste down, tiny hint of foxing to end papers, corners turned in, light abrading to extremities, sound, tight and clean condition. The cloth used by Salmon was very thin and consequently scratches and marks easily, this is the nicest copy we have handled. Member of the P.B.F.A. Imprinted at London, by Edmund Bollifant Second 1596. 1596. 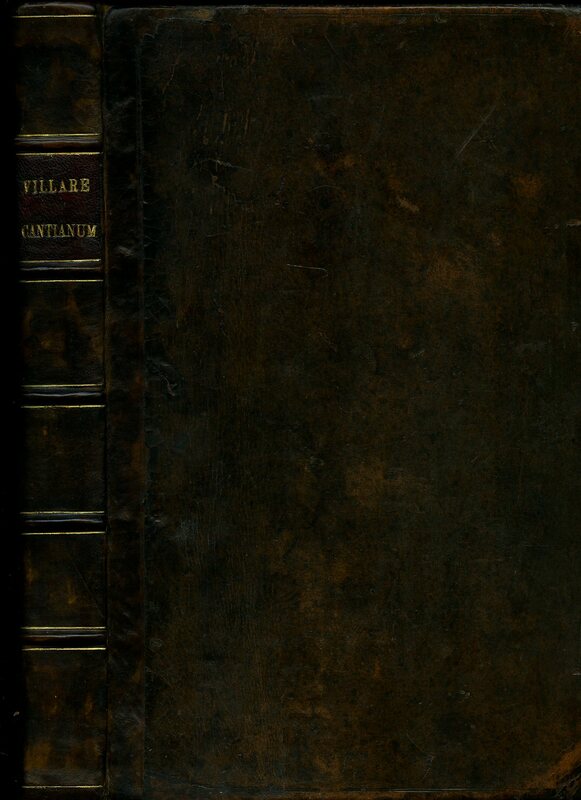 Second edition in calf covered boards, title label and gilt embellishments between five raised bands to the spine. 8vo 7¾'' x 5¾'' xiv, 588, 6 [pp] index. Single leaf map of England, 8'' x 12'' fold-out map of Kent showing the beacons. Lambarde was an English jurist and antiquary. In 1556 he was admitted to Lincoln's Inn and in 1568 he published a collection and transcript of Saxon laws. In 1574 he founded a hospital for the poor in Greenwich. Written in 1570 and first published in 1576, the book was the first county history published in Britain, in 1581 he published a manual for justices of the peace entitled 'Eirenarcha' and in 1601 he became keeper of the Tower records. Light toning to pages, general soiling to covers with rubbing to spine edges and corners, bookplate to upper paste down. Member of the P.B.F.A. 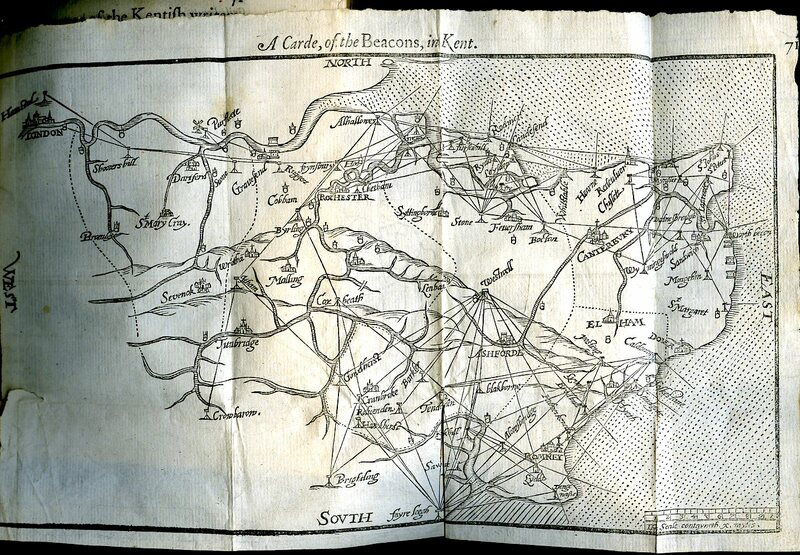 London, Printed by William Godbid, and are to be fold at his Houfe over againft the Anchor Inne in Little Brittain First Edition 1659. 1659. 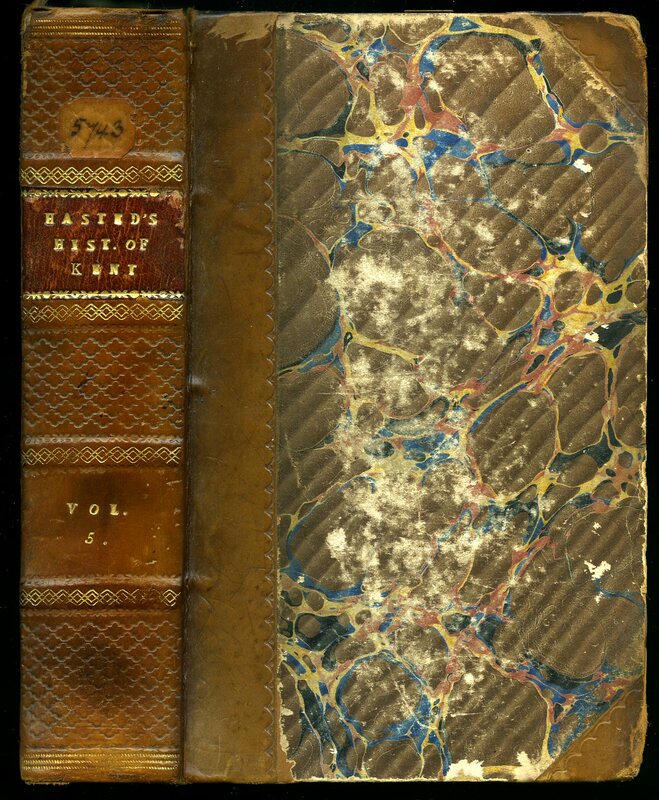 First edition in contemporary full calf binding, re-backed after old spine, five raised bands, gilt lines, new calf and gilt title label to spine, hand-sewn headbands, new end papers and paste downs. Quarto 11¾" x 7¾" xiv, 401 [pp]. Address 'To his worthy Friend Tho Philipott Efq; Upon his Diligent Survey of the Mannors of Kent: Entituled, Villare Cantianum, by Joh. Bois of Hode Efq.' Without map. Illustration from Roman times of 9 Maritime Towns, illustration of 'The Barons of the Ports', two other illustrations. 'A Table of Addenda or Omissions' signed 'James Beecher His Book 1705'. 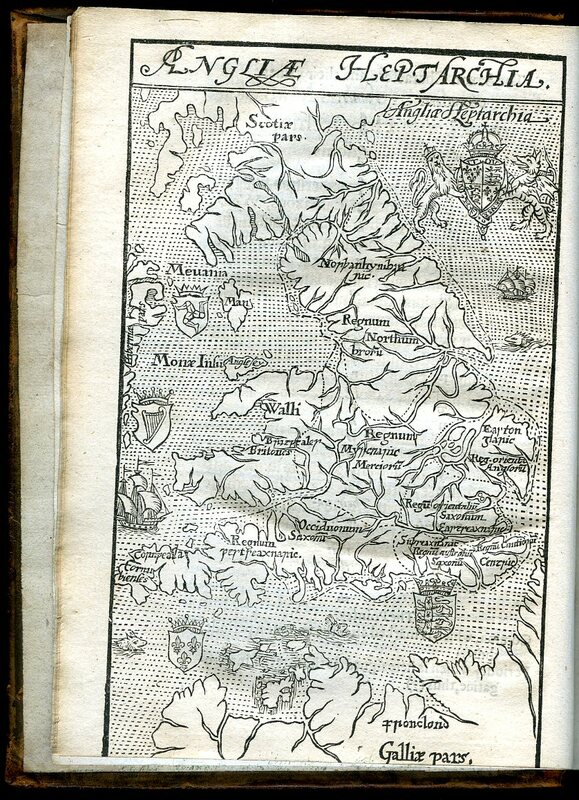 Separate chapter on 'The Defcription of the Islands' including Elmeley [near Faversham], Graine, Hartie, Oxney, Shepey [Including 'Conftables of Quinborough Caftle'], Thanet [Including paragraphs on Sarre, Downebarton, Quekes, Weft-gate, Dandelion, Nafh-court, Dene, Hengrove, Salmefton, Dane-court, Ellington, Manfton, St. Lawrence, Minfter, and Monkton], and Stonar. 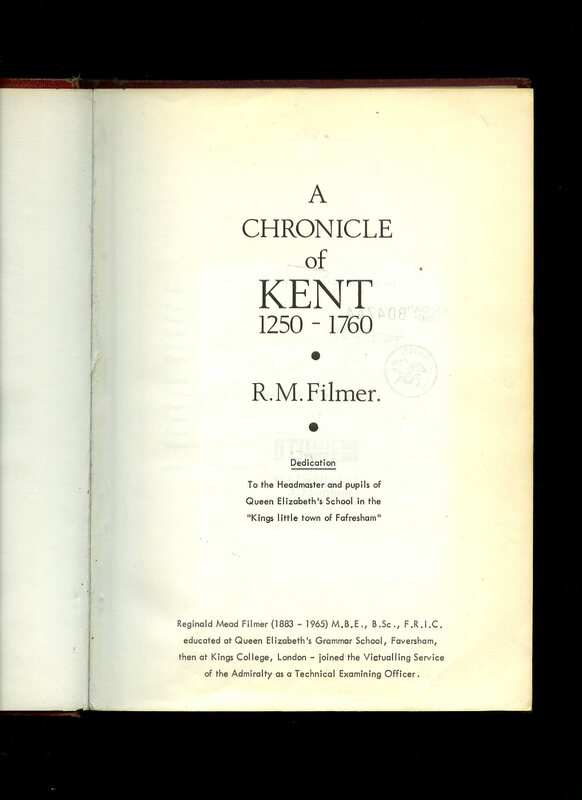 Final chapter deals with 'The Etymology, Derivation, and Definition, of all the Hundreds and Parifhes mentioned in the Map of Kent, as they are derived from fome Saxon Radix'. First six pages with upper corners missing [text not affected], general toning to pages, annotation to the magins of several pages, the former bookplate of 'Oscar Boulton' to upper paste down, name to front end paper, hand-written index letter to the top of each page. Member of the P.B.F.A. Published by Adams and Dart, 40 Gay Street, Bath, Somerset First Thus Edition 1970 [First Edition 1570]. 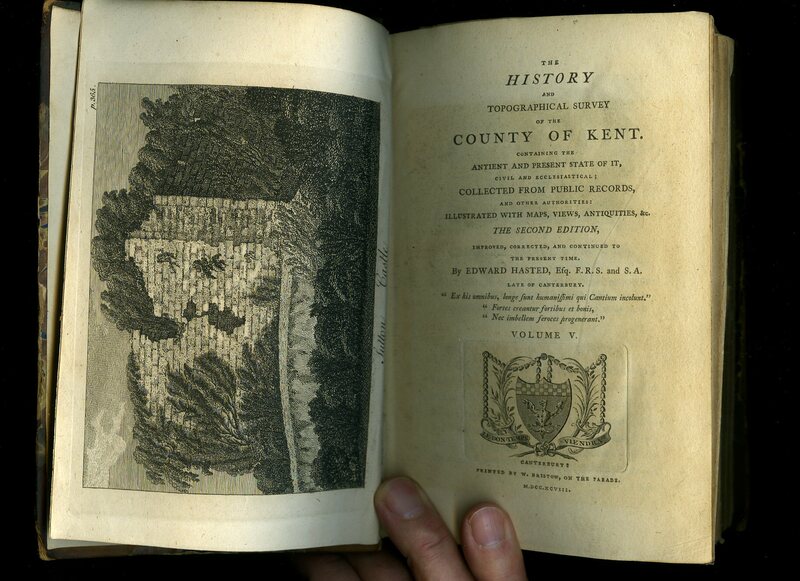 Printed by W. Bristow on the Parade, Canterbury The Second Edition 1798. Volume 5. Canterbury 1798. Contemporary half-calf, marble paper covers, faded burgundy and gilt title, author lettering and volume number to the spine. 8vo. 8½'' x 5½''. Contains [xxxvi] 590 printed pages of text with plate of Sutton Castle to the frontispiece and 4 fold-out maps of the Hundreds, as called for, plus two additional Hundreds Maps of Eyhorne and Brenchley & Horsemonden and West Barnefield, these are referred to in Volume VI. Rubbing to the boards, bookplate removed from the front paste down, contents clean and without any foxing. We currently hold in stock 5 other titles by this author. Member of the P.B.F.A. 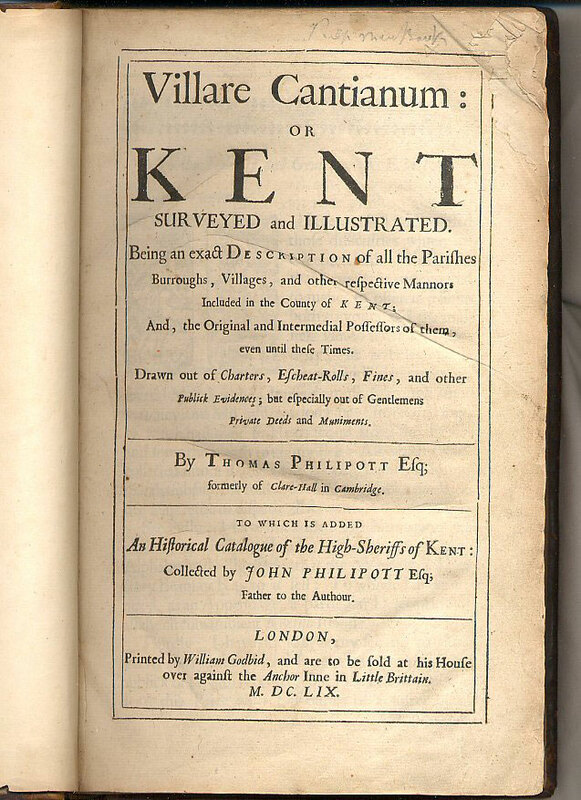 A Perambulation of Kent | Conteining the Description, Hystorie, and Customes of that Shire. 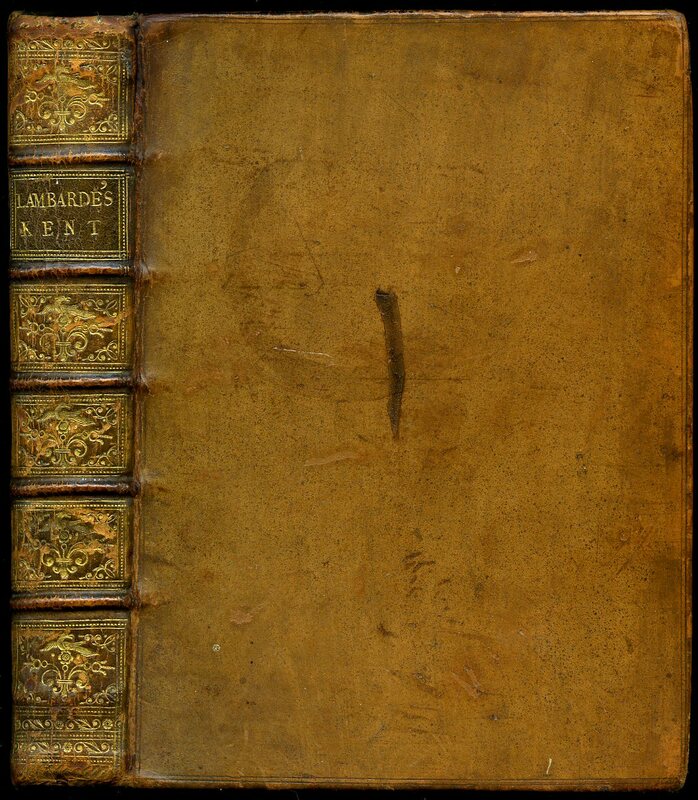 Written in the yeere 1570 by William Lambarde of Lincolnes Inne, Gent | First published in the year 1576, And now increased and altered from the Author's owne last Copie. Published by Baldwin, Cradock, and Joy, Paternoster Row, London, 1826. 1826. Hard back binding in publisher's original brick red cloth covers, gilt title lettering to the spine. 8vo 9'' x 6''. Contains xiv, 538 pp + 32 page publisher's catalogue, with frontispiece portrait, and map of the English Heptarchy, Carde of the Beacons was omitted. Very little spotting to some page margins and verso of the frontispiece, fraying of the cloth to the spine ends and in Very Good clean and square condition. Member of the P.B.F.A. Published and Printed for the Author by W. P. Dickinson, High Street, Maidstone First Edition 1898. 1898. First edition hard back binding in publisher's original vertically ribbed burgundy cloth covers, gilt lettering to the upper panel, floral cream and brown end papers. 8vo 8½'' x 6'' iv, 54, i [pp]. Errata slip tipped-in. Tissue guarded frontispiece, monochrome illustrations throughout. Almost imperceptible fading to the spine, very slight age darkening to the end papers and page edges and in Very Good clean and sound condition, binding firm and tight. Scarce in this condition, without any rubbing to the cloth, corners sharp and pointed, this is not an ex-library copy. Member of the P.B.F.A. Published by Clear Copies Ltd., 12-13 Bow Lane, London. Hard back binding in scarlet cloth cloth covers, gilt title and author lettering to the spine. 8vo. 9½'' x 6½''. Contains [xvi] 194 [xii] printed pages of text with monochrome illustrations throughout, fold-out map. Ex-Library stock with issuing sheet removed from the front and rear free end papers, reference number stamp to the copyright page. Contents clean and sound. Member of the P.B.F.A. Furley, Robert and Henry B. Mackeson [Sir Charles Igglesden born 1861 - died June 26th 1949, buried in Ashford Cemetery. Grandson of William Igglesden, founder of The Kentish Express who lived at Northbrook, Canterbury Road, Ashford. The Igglesden family diversified into Estate Agency, Land Agents, Removals, and Funeral Directors, however the Igglesden name disappeared from the High Streets of East Kent during the third quarter of the twentieth century, another casualty of 1970's economic slump?]. Published by Henry Igglesden, 94 High Street, Ashford and John Russell Smith, 36 Soho Square, London First Edition 1871, 1874. 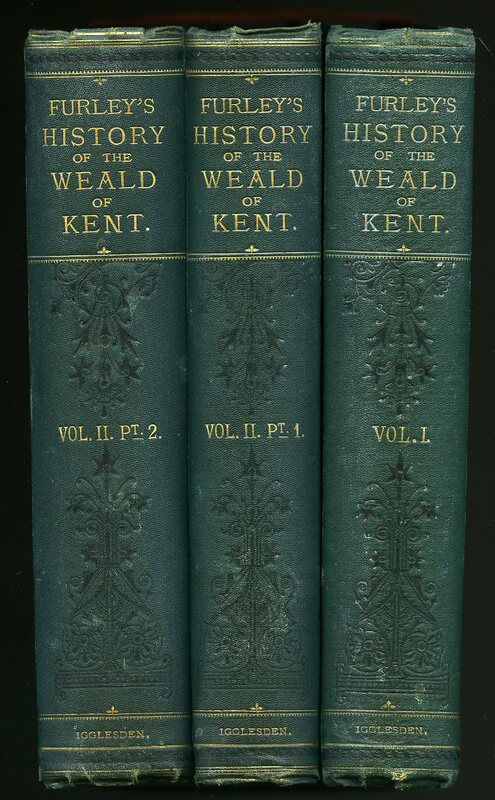 [Three Volumes] London 1871, 1874. Two volumes bound in three first edition hard back bindings in publisher's original matching emerald green cloth covers, gilt lettering and black scroll decorations to the spines and the upper panels, different gilt vignette to each front cover, brown paper end papers, bevelled edges, three books in two volumes with volume II being in two parts. 8vo 9'' x 6''. Large fold-out maps throughout the volumes with two maps to volume I having a tear to one section, gatherings of volume II Part 2 are slightly exposed, spines not faded and with only minor bumps to the extremities, sporadic light foxing to some margins and a Very Good neat and tidy set. Volume I has an old piece of thin paper stating 'With Mr Furley's / Farley's compliments.' It looks more Farley than Furley. Member of the P.B.F.A. Published by H. J. Goulden; Hull: William Andrew & Co., The Hull Press; London: Simpkin, Marshall, Hamilton, Kent, and Co., Limited., First Edition 1892. 1892. First edition hard back binding in publisher's original blue cloth covers, gilt title and author lettering to the spine and to the front cover, top edge gilt. 8vo. 9'' x 6''. Hand written number 511 of 750 Limited Edition copies. Contains tissue-guarded frontispiece, [x] + 273 pp. +  +  pp. publisher's advertisements with monochrome wood engravings throughout. Ink name to the front paste down 'William H. Hammerton, 1903', hinges cracked and repaired, rubbing to the cover edges and in Good condition. Member of the P.B.F.A. 9'' x 6'' single sided printed card. 14 verse Poem. 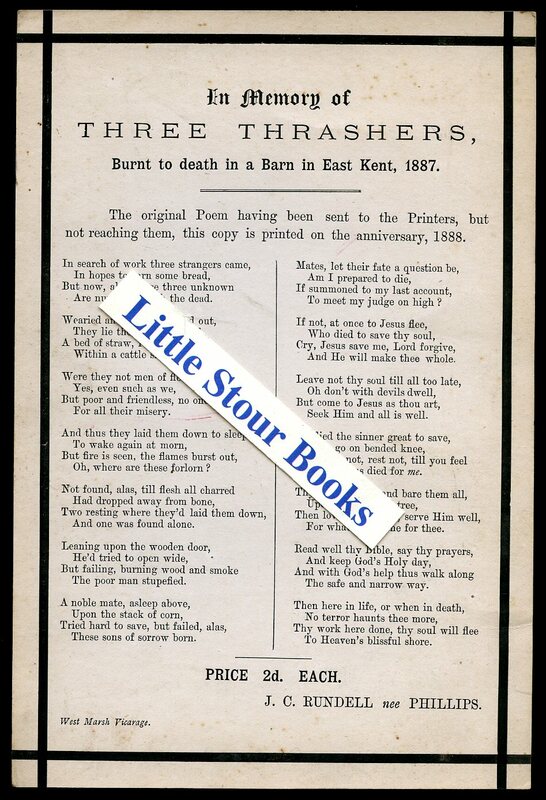 The original Poem having been sent to the Printers, but not reaching them, this copy printed on the anniversary in 1888, West Marsh Vicarage, priced 2d to the card. First verse 'In search of work three strangers came, In hopes to earn some bread, But now, alas, these three unknown Are numbered with the dead.' Member of the P.B.F.A. 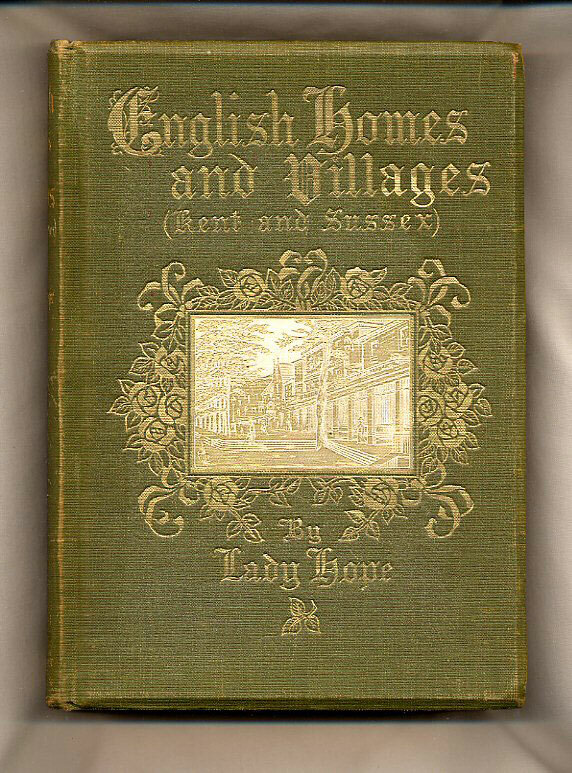 Published by H. Igglesden & Co. Ltd., High Street, Ashford First Edition 1894. London 1894. First edition hard back binding in publisher's original dark emerald green cloth covers, gilt lettering to the upper panel. 8vo. 7½'' x 5¼'' 52 pp. Tissue guarded frontispiece, monochrome illustrations throughout. Age darkening of the paper to the end papers, without any ownership markings, corners sharp, without any rubbing to the cloth and in near Fine condition, no dust wrapper as published. Member of the P.B.F.A. 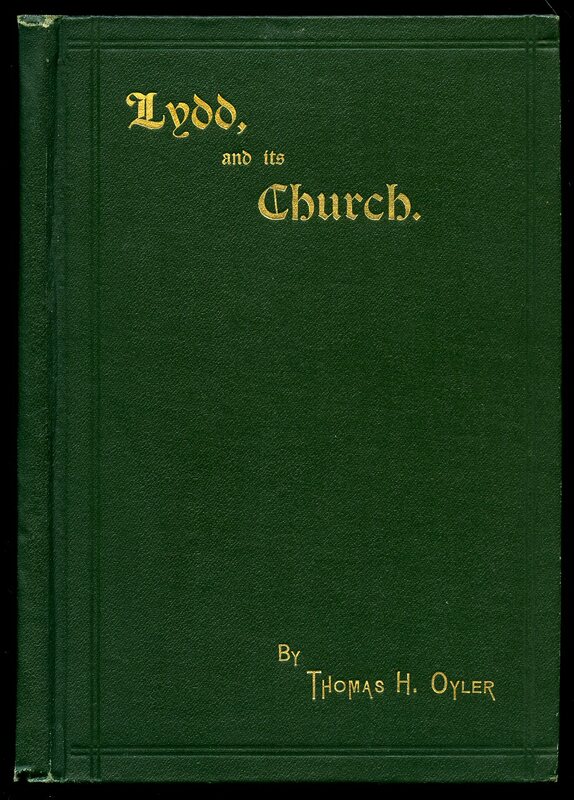 Published Privately by the Author First Edition 1909. 1909. First edition hard back binding in original very dark green buckram covers, plain gilt lettering to the spine. Quarto 9½'' x 8'' xvi, 124 printed pages of text. Printed on Canterbury note paper with Canterbury Cathedral watermark and text to each leaf. 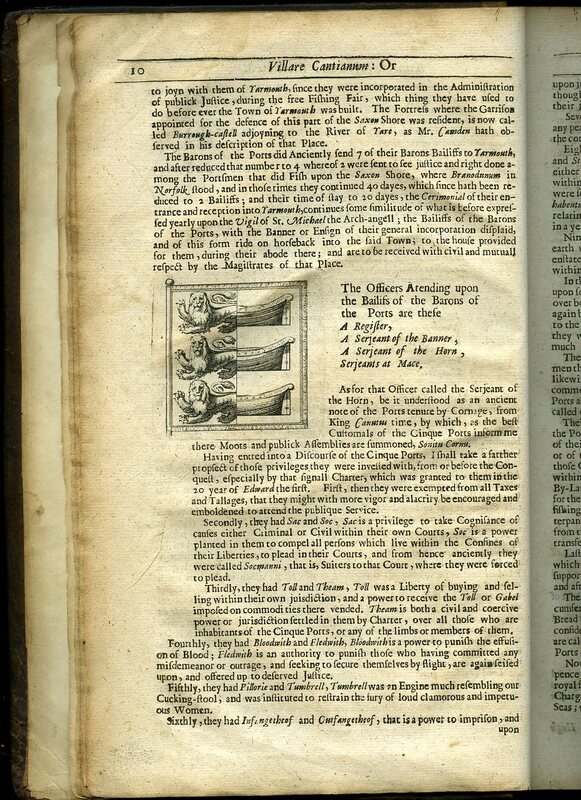 Seven full-page single sided monochrome plates printed on high quality strong rag paper, capable of taking a process block illustration on the paper itself without the intervention of any gelatinous coating. 1 of 303 copies privately printed. List of subscribers. 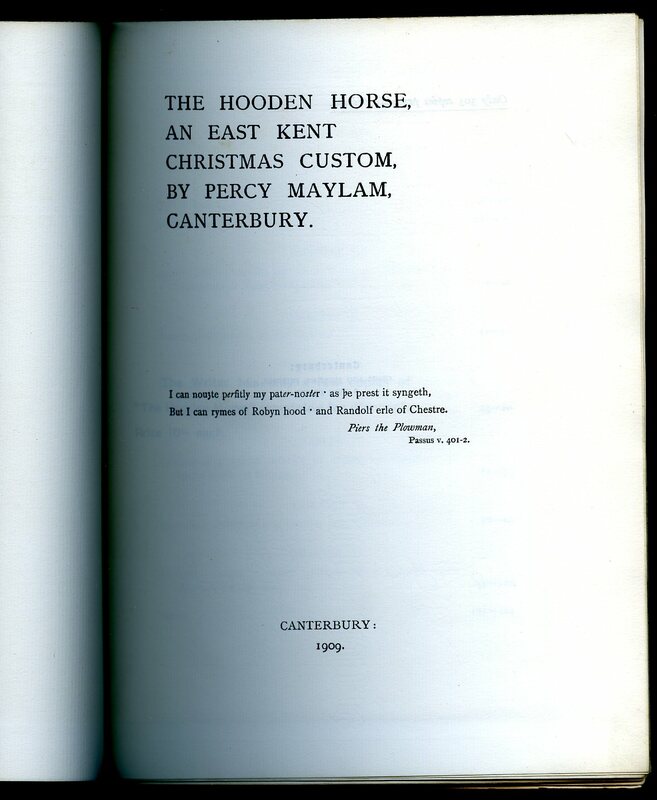 Hoodening is an East Kent winter custom dating back many centuries. A new play is written each year in rhyming couplets by one of the troupe, and references to recent events are included, although the setting is based on a ploughing team from the 19th Century. Over the last few years numerous hoodening groups have appeared in Kent. Most of these appear to be derived from Morris teams; some focus on singing, others on theatre. There is no clear etymology for the words ''hooden'' or ''hoodening''. The Oxford English Dictionary entry is quite brief, but other theories include ''hooded, ''hide'' [as in animal skin or as in concealment] and ''hoaden'' [a type of cloth]. There is a chance that it may have come from ''Woden'' [the Norse god], as he had a famous horse and this has evidently influenced the similar custom of the Schimmelreiter. Small ink name to the top of the front free end paper, light surface rubbing to the fore edge of the upper and lower boards, no dust wrapper as published. Member of the P.B.F.A.